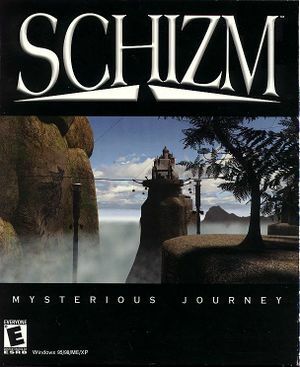 Also known as Mysterious Journey: Schizm. Two retail versions were released - on 5 CDs and 1 DVD. The DVD version contains graphical improvements, FMV intro cutscene and additional puzzles cut from the CD version. Saves are Schizm.s00 to Schizm.s16. Runs in a bordered fullscreen window. Cannot be moved or resized. Gameplay is capped at 25 FPS.